Steve "Cab" Caballero Pro Model. 10.0" x 29.75". New in Bag with Inserts (numbered). Ltd Edition of 750 Worldwide. This is one of the 9th series of the Bones Brigade reissue decks. Series #9 features the boards that were seen in the classic 1987 "Animal Chin" video to cellarbrate it's 30th anniversary. For this series Powell have reduced the numbers released, for most models, so they may not be available for as long as the previous series. Like most of the 80's Powell graphics this one was. Johnson (VCJ) as was the iconic dragon which is on the top. The dip/finish is that slightly pearl effect paint that Powell use. A superb looking Cab reissue. Medium concave, short flat nose & a steep full sized squared tail kick. Drilled with old & new skool truck holes so you can fit your OG 1980s trucks to it if you wish plus any modern trucks without drilling any extra holes. Trucks : Indy 169s, Tracker Six Track. 149s/8.5 sized would also work especially if using wider wheels. Wheels - Take your pick from the Powell and Santa Cruz/OJ re-issues; Rat Bones, G-Bones, Slime Balls, Big Balls. 78a reds are the softest and best for transport but the greens and blues also transport really well. If you need advice on a set-up, please get in touch. 15.25 wheelbase (inside to inside holes). Width over front truck : 9.25. Width over rear truck : 8.25" Drilled with both new & old hole truck paterns Nose and tail lengths should be increased by 1/2" to compare with decks drilled with the new skool hole pattern. (fitted if required, at no extra cost). Loads more re-issued decks plus trucks, wheels, parts, t-shirts, stickers, etc. Is mega expensive to send boards to. Is also mega expensive to send boards to. We reserve the right to alter the rate if you are in one of these remote regions. Buyers in the UK and EU will NOT incure any extra charges. Buyers from countries outside the European Union may incure import charges. Check your country's import/export rules. We dispatch Monday to Friday (Saturday on request) except bank holidays. Courier services only deliver on weekdays Sat. Ireland, Isle of Man, Scottish Highlands & Islands, etc. The Channel Islands are classed as an international destination for courier services. We will do our best to rectify any issues but if you dont tell us first we cant rectify anything. We are all human so mistakes can happen but a chance to put things right is appreciated. Is your address correct & complete? This is basic but it happens too often. If you return an item to us that has been used it will be send back to you at your cost! If you return an item to us that we deem not faulty we will send it back to you at your cost! 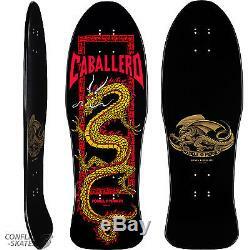 The item "POWELL PERALTA Chinese Dragon Caballero Skateboard Deck Bones Brigade Series 9" is in sale since Saturday, May 06, 2017. 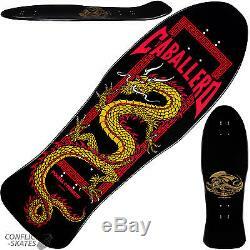 This item is in the category "Sporting Goods\Skateboarding\Decks". The seller is "conflict-skates" and is located in Leicester, Leicestershire. This item can be shipped to all countries in Europe, United States, Japan, Canada, Australia.